Dear Applicants, Gujarat Police has declared notification for Constable & Jail Sepoy Vacancies. There is 6189 Post are available for Gujarat Police Recruitment 2018. Participants should check here qualification, age, and application fee for Gujarat Police Jobs 2018. Online registration will be started form 18.08.2018 for Constable & Jail Sepoy Vacancy. Interest and Eligible Applicants should fill up their application form before last date 07.09.2018. Candidates may also check Selection criteria and Physical Division before applying. For more detailed information regarding Gujarat Police Bharti 2018, aspirants should read the below article carefully. What Are The Important Dates For Gujarat Police Jobs 2018? What are the Selection Criteria & Pay Scale For Gujarat Police Jail Sepoy Vacancy 2018? Candidates should check here Post wise division of Gujarat Police Vacancies. Participants will collect here details regarding the number of Male and Female Vacancies for Gujarat Police Constable Bharti 2018. Participants should download Gujarat Police Notification 2018 for further more details. Applicants should fill up their application form carefully otherwise their form will be rejected. Participants may check here eligibility criteria for Gujarat Police Recruitment 2018. 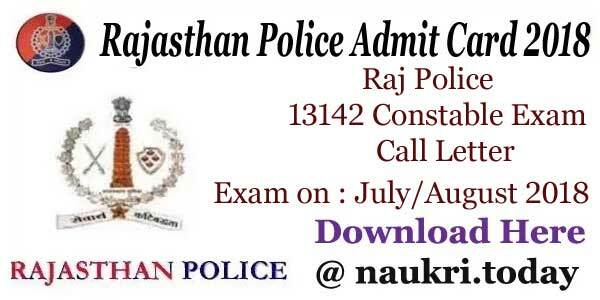 Aspirants may also consult all the details from official Gujarat Police Notification 2018. Here we gave you links to apply for Gujarat Police Bharti 2018. Aspirants who are going to participate in Gujarat Police Constable Jobs must have 10+2 Degree or its equivalent. 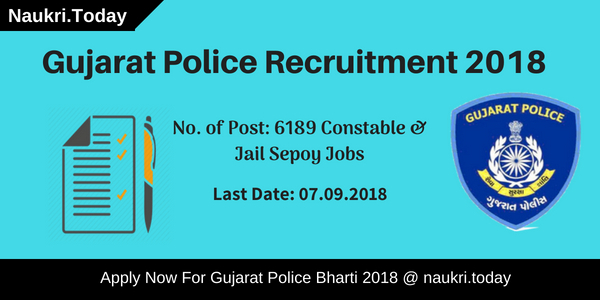 Participants should read official Notification of Gujarat Police Jail Sepoy Recruitment 2018 for more information related to education qualification. Applicants should check here Physical Standard for Constable & Jail Sepoy Vacancies. The Department will set particular criteria of age limit for applying candidates. Participants must have age between 18 years to 33 years are eligible for Gujarat Police Bharti 2018. Upper age relaxation will be given as per government rule. For further more information aspirants should download official Gujarat Police Jobs Notification. Participants need to pay some amount for an application fee. Applicants who belong to General & OBC Category should pay Rs. 100/- as an application fee. Participants of SC/ST/Ex-Serviceman category need not to pay any amount for an application fee. Candidates can pay their examination fee through online mode such as by Credit Card, Debit Card, & Internet Banking. Selection of Candidates should do in three stages such as Written examination, Physical Efficiency Test, and Medical Examination. Applicants who perform well in all three stages will get selected for Gujarat Police Jobs 2018. For More information candidates should check official Gujarat Police Notification 2018. Participants should consult official Gujarat Police Jobs 2018 notification for pay scale details. Candidates may apply form links given here for Gujarat Police Jail Sepoy Bharti 2018. The Gujarat Police Department will pay a good amount salary to the selected aspirants. Participants who found themselves eligible for Gujarat Police Vacancy 2018 must fill up their application form before the last date. After filling up application form candidates should submit their application fee. Participants can do their payment through credit card, Debit Card, & Internet Banking. Aspirants should follow these steps to apply for Gujarat Police Bharti 2018. Applicants should log on to official Website of Gujarat Police i.e police.gijarat.gov.in. Now may search for Gujarat Police Recruitment section at home page. Click on Gujarat Police Constable Notification PDF. Participants should read it carefully. After that applicants should submit their application fee. Conclusion: Gujarat Police Department has issued notification for filling up 6189 Constable & Jail Sepoy Vacancy. Candidates must check here eligibility criteria, age, and application fee for Gujarat Police Recruitment 2018. Last Date for online Registration is 07.09.2018 for Gujarat Police Bharti 2018.